Subhash Transport Corporation is offering Crane Services which includes Mobile Cranes Services, Telescopic Cranes Services, Hydraulic Telescopic Cranes, All Terrain Cranes and Hydraulic Cranes. We are the leading service provider in Crane Hiring Services in the Indian Subcontinent. Our reliable services are highly recommended in various industrial and commercial purposes. 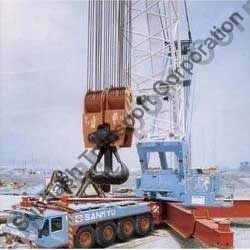 The cranes we use in these services are procured from the leading brands from all over the world. We have the team of experienced professional who are always ready to serve our valued clients with a smile. They will help out in various difficulties and solving the problems with ease. In addition, our services can be availed at attractive rates. We are one of the best Crane Companies. We offer a wide array of the bet quality cranes rental for projects. with the commitment to serve better, we specially procure our cranes from the leading companies. They are highly preferred and used in various shutdown jobs, expansion plants, green field projects and rehabilitation projects for nuclear plants, cement plants, refineries, thermal plants, ports and airports. Our team of professionals delivers a friendly and supportive atmosphere all through the projects. Looking for Crane Services ?